Deposit dengan kartu kredit prosesnya cepat ,hanya selang waktu 30 menit atau paling lama 2 jam ,isi account kita sudah nertambah . Kelemahan menggunakan kartu kredit adalah proses withdraw / penarikan modal yang cukup lama .memakan waktu sampai 3 hari. Disini kita bisa mengisi account Binary.Com kita cara langsung transfer melalui bank. Kelemahannya proses deposit dan withdraw memakan waktu lama sampai 6 hari . Untuk mengisi account binary kita, juga bisa menggunakan a-currency yang sudah kita miliki seperti PerfectMoney, Bitcoin dan lain-lain . Bisa dilihat di menu Deposit pada situs betonmarkets. 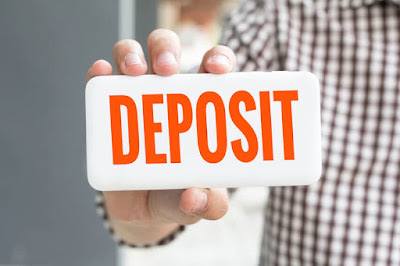 Untuk mempercepat proses deposit dan withdraw ke account Binary.Com, beberapa pihak menawarkan jasa deposit dan withdraw. Kelebihannya adalah proses lebih cepat, hanya butuh waktu 15 menit-an untuk deposit dan perlu waktu paling lam 1 jam untuk withdraw. Salah satu cara deposit adalah melalui agen pembayaran. Namun, periksa dahulu pada menu Kasir Binary.Com apakah anda sudah bisa deposit melalui agen pembayaran, jika belum silakan kirim email melalui menu Hubungi Kami kepada bagian support Binary.Com, minta agar bisa deposit dan withdraw melalui agen pembayaran. 1. Login di website agen pembayaran fastchanger168. Masukan Username dan Password lalu klik Login. 2. Klik BELI Binary.Com kemudian isi form pembelian secara benar. 3. Periksa ulang data yang diisikan pada form sebelum mengirimkan permintaan pembelian pada agen untuk diproses lebih lanjut. 4. Transfer segera dalam waktu kurang dari 24 jam, agar permintaan pembelian tidak hangus atau dicancel oleh pihak agen. Sebisa mungkin gunakan ATM Non Tunai sehingga dapat mencantumkan berita pesanan. Hindari penggunaan setor tunai pada teller bank. 6. Setelah transfer, kirimkan SMS konfirmasi kepada pihak agen baik melalui SMSsesuai format yang dijelaskan sebelumnya oleh agen fastchanger168 pada saat Order BELI. 8. Periksa segera balance account Binary.Com yang anda miliki. Hi, heard about The Recovery Firm, they specializes in assets and funds recovery. Came across them when my company has issues with our binary options and we almost lost millions in dollars to fake brokers. The Recovery Firm uses distinctive strategies to help recover funds with no legal issues, this has been experienced bcos as the Financial Manager of my company, I had to work closely with The Recovery Firm. They also provide services that involves forex and crypto trading, also investment management and guides. 100% professionalism is their virtue. Contact: firmrecovery@gmail.com or http://bit.ly/2FIveoL check out for more information or inquiries. I was conned into taking a bonus matching my original $17000 investment made over the phone. According to CToptions policy, I cannot withdraw any funds until $30,000 worth of trades has been executed. This was not explained to me and when I wanted to withdraw $3000 from my $27,000 balance, the request said pending for 6 weeks, and after several requests over 6 weeks made to account managers who ignored my requests, I finally got a request denied. I eventually was able to get a means to recover my money back from them with the help of wealthwatch@tuta.io a recovery expert. Be careful out there people. reach out to wealthwatch@tuta.io to help you get all your money back. If you are looking for a professional Hacker that specialized in genuine hacking services. Contact email - hackethics00 8@gmail.com. I initially invested a total of $95,000 over a period of 18 weeks. My bonus/profit was $170,000, every attempt to make withdrawal failed and I was instructed to make another deposit of $25,000 before I can make withdrawals which I did. Up till now I'm still unable to make withdrawals and all attempt to contact broker has failed. This is very pathetic and I advise everyone to desist from binary options generally. I did a due diligence test before investing with them but guess what I ended up getting burned. This is to create awareness, not everybody can be as lucky as I was. I'm saying this because I was able to recover my funds. Thanks to lonnie, he’s a private investigator and wealth recovery expert...Contact him on wealthrecoverynow@tutanota.com for more enquiries. Thought someone might find this information useful. Payperex is total scam. I feel obligated to recommend the services of HACK NET after helping me recover some funds in just 22days. Some challenges of withdrawals we traders are facing today in binary option is not because binary option is no longer a nice place to invest capitals, but the problem is that there’s a lot of scam brokers all over the world. If you’re facing some challenges of withdrawals or your broker manager is always asking you to make more deposit before you could place a withdrawals from your funds or you traded and lost your funds without any reason or maybe you noticed that your broker manager manipulated your funds, i once lost over $350k to www.payperex.com , it was so hard for me to get myself because i was going to loose all my investments. A friend i met on reddit introduced me to an ethic hacker who was able to help me retrieve all my funds within 22days. I appreciate Hack Ethics for helping me recover my stolen funds 750,000 GBP from Binary Brokers and Fake Hackers within 24 hours. Contact him – hackethics008@gmail.com for any desired Hacking Services. STOP BEING SCAMMED BY FAKE HACKERS and BINARY BROKERS AND FAKE HACKERS. Hire a Ethical Hacking group who are professional and real. Hack Ethics is an experienced Private Hacking Organization with a spare master key that no one has. It was like a miracle when he helped me recover my 750,000 GBP within 48 hours and now I feel free like a bird. Also he helped monitor my cheating spouse which I got first-hand information from her phone. Now I get all her incoming and outgoing text messages, emails, call logs, web browsing history, photos and videos, instant messengers(facebook,whatsapp,bbm,IG etc) , GPS locations, phone tap to get live transmissions on all phone conversations. Specialized in different Hacking Services some of his most popular hacking services or social network and know if your partner is cheating on you hack into your partners phone. He can help you recover your lost binary BTC , TBC, ETH and every other stolen funds within 48 hours. Just saw this message on a Scam Database the Internet. I also fell victim to this scam broker, Binary.com. Also lost more money to "experts" in recovery room scams. I was left in huge depts. I almost committed suicide. I was finally able to recover my money with the help of a pro I found on the deep web. I am happy to share my experience and guide anyone going through the same problem. You can reach out to me on pmcq5354@gmail.com. Happy to help! I have been scammed and scammed and scammed again. I invested with four binary companies and lost all of my investments totalling £750,000 Then I was contacted by someone offering help – a company who specializes in binary recovery. I was scammed by them again. By the end of it all I had lost all of my savings and I was in serious debt. I was desperate for help and that made me vulnerable to recovery scams. My husband is not around anymore and I have an 8 year old son with learning difficulties. The pressure of being a single, working mother with a child who needs so much additional attention and support became overwhelming for me. I also felt too traumatized to trust anyone else and I was very afraid, but I had no choice other than to trust HACKETHICS008@GMAIL.COM. He has been incredibly helpful and supportive and also very understanding about all of my fear and concerns he helped recover all of my funds back within a week using unethical means I feel quite , tremendously joyous about the decision to use. I really hope that others do not have to go through what I did, and I wish that I had realized before things were so bad that I was being scammed. I hope my story might help others to not be fooled the way that I was. I invested 90% of my retirement payment on binary options with the mindset of getting it multiplied and enjoying a better retirement life. Once again, I appreciate Hack Ethics for helping me recover my stolen funds £750,000 from Binary Brokers and Fake Hackers within 48 hours. Contact him or Skype for any desired Hacking Services.It was like a miracle when he helped me recover my £750,000 within 48 hours and now I feel free like a bird. It was sweet and smooth from the start, withdrawals were easy and consistent until it gets to a point I started to be denied withdrawals and that was how I lost all money, I couldn't get my investment amount back not talk of the bonuses. I contacted several lawyers but it was all waste of time and money, they couldn't render an inch of help. God so good to my old self and family, My smile returned after I met with this certified binary options recovery expert that helped me recover my money within 48 hours from the brokers, it was worth it to pay him 20%. You can contact the expert on ''HACKETHICS008@GMAIL.COM OR WICKR - recoverygenius" if you have found yourself in same situation as me also he can render any other desired hacking services within 48 hours. STOP BEING SCAMMED BY THESE FAKE HACKERS. Hack Ethics is an experienced Private Hacking and Certified Binary Recovery Expert Organization with a spare master key that no one has. Also can help you recover your lost or stolen funds from any Binary Platform and Fake Hackers. Our service takes just within 24-48 hours. Hire a Ethical Hacking Expert who's professional and real. Specialized in any desired Hacking Services including Romance Scams and so on. Contact - hackethics008@gmail.com. A professional and experienced hacker providing hacking services for a variety of client needs. Specialize in many different Hacking Services some of my most popular hacking services. I had very huge doubt on the possibility of me being able to recover the huge finances Binary Option had taken from me, I even lost all hope. However, I got to make contact with xiaomingrecovery @ gmail . com and big thanks!, I was able to recover a huge sum of my money back. And to top it all, I was not to make any upfront payments of any sort for the service until I got my funds back and then I did the needful. And also if you have lost your hard earned money to Forex trading, Romance scams, or any online investment of any sort and you are looking to recover then you should contact them now. After losing the money meant for my school fees 23k to Binary Option last year I thought that's the end of my world not until my brother-in-law introduced me to a recovery agent whitecyberwiz at gmail com. who helped him to recovery his lost fund help me to recover 90% of my money too. I recommend him today and thank me later. I just recovered over 95% of the 55btc I had invested with quadrigaCX that they wanted to do away with their scheme of their ceo dying and being the only one with the passwords. Get in touch with XIAOMINRECOVERY via gmail now and recover your finances before its too late. Plus its so sad hearing stories of people losing huge amounts of finances to these so called Binary Options Brokers and Cryptocurrency platforms/experts. They entice people with ridiculous amounts of profits and make them keep paying money to them in the guise of investments.